MADRID, Nov. 28, Visiting Chinese President Xi Jinping on Wednesday urged Spanish enterprises to make best use of the public platform of China International Import Expo (CIIE) to win more business opportunities and promote China-Spain economic and trade ties to a new height. 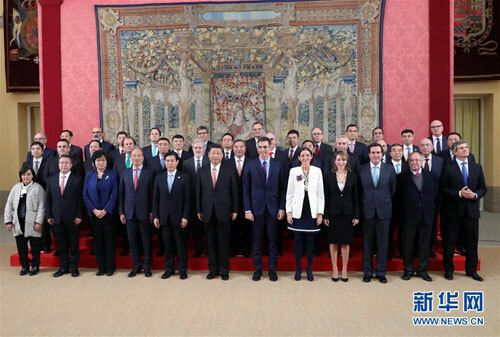 When meeting representatives from the China-Spain Business Advisory Council together with Spanish Prime Minister Pedro Sanchez, Xi extended his congratulations to the establishment of the business advisory council and its first meeting on Tuesday. He said building strong synergy between the two countries' strategies and realizing complementary advantages will help promote connectivity between Asia and Europe and push the global economy to develop in a more open, inclusive and balanced way. He said he believes that with the joint efforts of entrepreneurs and business communities from the two countries, the mutually beneficial economic and trade cooperation in the new era will open a new chapter and bring more benefits to the two countries and their peoples. For his part, Sanchez said at a time full of changes, Spain pays more and more attention to Asia, especially China which attaches importance to its opening-up to the world. Noting that China has become an important trade partner and one of Spain's main export destination, Sanchez said his government supports the country's economic, trade and investment cooperation with China, and supports the two countries' business communities in strengthening links. Also on Wednesday, Xi's wife, Peng Liyuan, visited the Teatro Real (Royal Theater) in downtown Madrid, accompanied by Queen Letizia of Spain. Peng called for more art exchanges between the two nations and stronger friendship between the two peoples.